11.20.2003 - Most of the time, pigeon control is done via the installation of deterrent devices. So for example, if pigeons are roosting in an undesirable area, I can install a deterrent such as bird spikes to prevent them from nesting in that area. In addition, at times I can set special pigeon traps to trap and remove the birds. However, in certain situations, lethal control is the only answer. This type of pigeon work is fairly common in the industry. If pigeons are scattered about in a facility, and it's unfeasible to install deterrents, and the conditions don't allow for trapping (the trapped birds have to be euthanized anyway, since pigeon relocation is not an option), then pigeon control via BB gun may be the way to go. In this particular case, pigeons were roosting in a huge parking garage, in a few selected places. They were pooping on cars. There weren't too many birds or nesting areas, and they were scattered about on different floors of the parking garage. The garage was huge, with several floors. The installation of bird spikes would have been overkill - it would have taken tens of thousands of feet of spike, at a cost of hundreds of thousands of dollars, just for a few birds. And the pigeons couldn't see or congregate in any efficient trapping station area. Thus, the easiest way to control these few birds was to go in and shoot them. 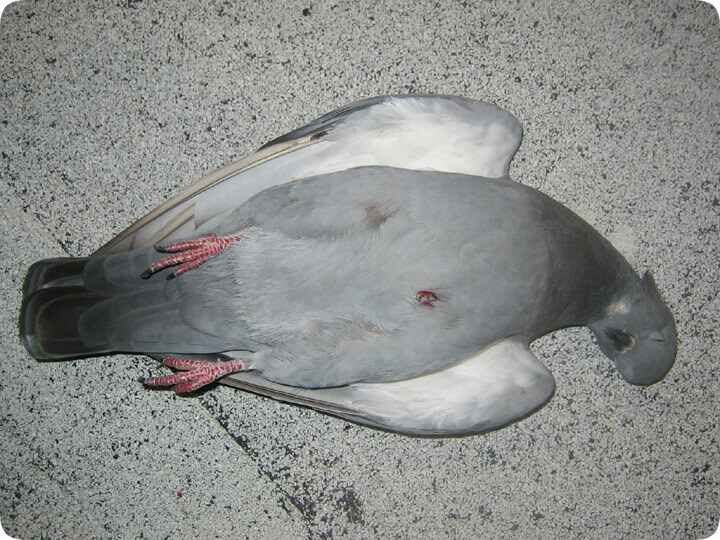 Pigeon shoots are usually conducted at night, when the birds are asleep. I use a 1000' per second air rifle - that's pretty powerful - which is accurate and which fells the birds in a single shot. They are easy to approach at night, and can be picked off with precision. It's rare that I ever use lethal means for wildlife control. In fact, I only use it for rats and flying rats - pigeons. I fully believe in being as humane as possible, and I'm not a hunter, and I don't like killing for sport. But this happens to be an effective option in the urban pigeon control toolkit, so I use it from time to time. It's important to be a good shot, so that the birds are killed instantly and do not suffer. It's true that with time new birds will come back, so every year or so I go to this location and pick off a few birds, and the parking garage is kept clean and bird-free, and the cars don't get pooped on.